IS PART OF THE CREATION SCIENCE DIRECTORY. WAS A GUEST ON REAL SCIENCE RADIO. WROTE THE PREFACE TO C. S. LEWIS: ANTI-DARWINIST. HAD AN ARTICLE PUBLISHED IN CREATION EX NIHILO MAGAZINE. HAD ARTICLES PUBLISHED IN THE CREATION CLUB MAGAZINE (PRINT AND ON LINE). WAS FEATURED ON A MAJOR WEST VIRGINIA TELEVISON NEWS PROGRAM. EVOLUTION EXCLUSIVELY EXISTS IN THE BUGGY BRAINS OF BELIEVERS IN DARWIN’S DELUSION. THAT INSECTS AND HUMANS ARE COUSINS! "The last common ancestor of man and fruit flies lived about 600 million years ago. All the genes needed to build a body were already present in that ancestor, and today we still share virtually all of our body-building genes with fruit flies." HERE IS AN EXPOSE’ SHOWING HOW EVOLUTIONISTS EVANGELIZE. INSECTS ARE INCREDIBLE AND INSPIRATIONAL! Scientists agree with Creationists that “INSECTS ARE MARVELS OF DESIGN”! Evolution is not “change”. Real science shows that creatures (especially insects—beetles make a great example) have variations that can be decreased or increased by environment or heredity (not even by a slick synonym for evolution—natural selection). Evolution, although True Believers in Evolution (TBEs) avoid admitting it, is a belief that life arose from unguided natural forces and all life came from a common ancestor. God created the creeping creatures, which includes insects, and “God saw that it (His creation) was good.” (Genesis 1:25) Insect experts say that we could not live without insects. About a million different insect species have been identified and there may be more than seven million not yet found. There are about 10 quintillion (1 followed by 19 zeros) insects alive right now! There are over 1 billion insects per person. Insects make up over 80% of all animals! They live in the arctic, deserts, water, and soil. Only a few insects are pests and the Bible explains why. Of everything God created, insects have the greatest variety of size, shape, color, and behavior. Without insects, humans would face insurmountable problems. EVERY insect is a miracle of engineering, artistry, and ingenuity! OTHERS BRAINWASHED BY GOVERNMENT SCHOOLS. HE GIVES THEM AN IRRITATING ITCH AND EXPENDS THEIR ENERGY. WHAT’S WORSE? A FLEA OR A DEMON? THE (self-) RIGHTEOUS RIGHT TEA PARTY NATION. KIDS: See ARTICLES, LINKS, and GET BUGGED. PLEASE: Copy this page and as many others*as possible on this site (especially GET SAVED) before the Enemy shuts them down. The cartoon was drawn during the evolutionism battles. 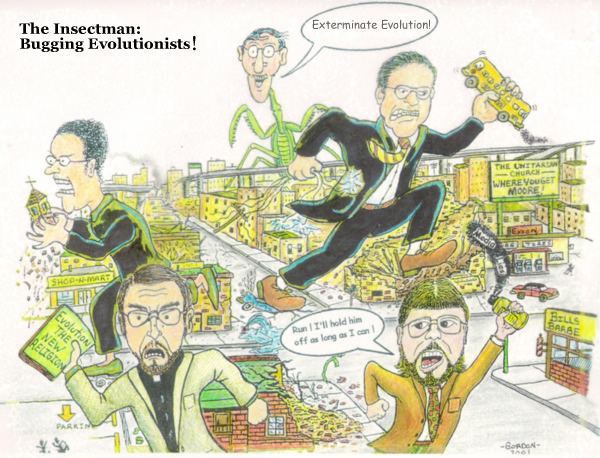 The caricatures are of Karl Priest at the top and (clockwise) atheist editor of the local left-leaning newspaper, liberal Catholic assistant newspaper editor of the same paper, Unitarian evolutionist, and ACLU director. >began his life at a rescue mission. >is a Born Again Christian. >participated in the event that launched the current Cultural War. >grew up in one of the toughest neighborhoods in the nation. >served in the United States Navy. >taught school for over 30 years. >proved that public schools cannot be redeemed. > is the West Virginia coordinator for Exodus Mandate. >appears in the award winning documentary IndoctriNation. >is a qualified speaker on “public” education. > is a founding member of the Christian Education Initiative. >salutes the courageous kids of the first (and only?) “public” school Creation Club. 1. Only one life, ’twill soon be past. Only what’s done for Christ will last.” Read the rest. PLEASE print these pages before the Enemy pushes them off the Internet. The photos on this website (click on the thumbnail if included) can be enlarged by holding the CONTROL key and scrolling the mouse wheel. Reverse the direction to reduce the size. You must have WINDOWS XP or newer and be using INTERNET EXPLORER, FIREFOX, or GOOGLE CHROME. Karl Priest does not support the hate of any individuals or groups. Telling the truth about individuals or groups is an act of love. Any use of non-King James Bible references to Bible verses is not supported by Karl Priest. Please use the King James Bible Online to look up scripture references on this website. Opinions expressed by others on any part of this website are their own and not necessarily supported by Karl Priest. In accordance with Title 17 U.S.C. Section 107, any copyrighted work herein is archived under fair use without profit or payment to those who have expressed a prior interest in reviewing the included information for personal use, non-profit research and educational purposes only. The information contained in this website is provided "as is" without warranty of any kind. The entire risk as to the results and the performance of the information is assumed by the user, and in no event shall Karl Priest or host provider be liable for any consequential, incidental, or direct damages suffered in the course of using the information on this website.